A printer is a hardware device that is connected to computer to obtain output. Nowadays it can also be connected to a digital camera to take print outs of pictures directly. The output here is called the hard copy output. Apart from printers, there are other output devices also like monitor, plotter, speakers, headphones, projectors, and so on. Printers are generally classified into two categories – impact and non-impact. Impact printers print by establishing a direct physical contact with the paper, but non-impact printer’s work otherwise. 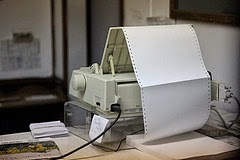 A Dot Matrix Printer is the oldest type of printer and one of the good examples of computer printer that prints by direct impact of an ink-soaked cloth ribbon against the paper. Much like the print mechanism of a typewriter, the printer head moves in an up and down motion or runs back and forth on the paper. These are called impact printers because printing involves the use of mechanical pressure where the pins against the ink ribbon strike on the paper. The prints can be produced in varied fonts and arbitrary graphics in the form of dots. These dots are produced by tiny metal pins or wires driven back and forth or up and down by the power of a tiny electromagnet or solenoid. The printer head continuously moves and prints only one vertical text line at a time. The Dot matrix printers are cheap and easily available in the market. They can make carbon copies of the print out unlike non-impact printers. The printing costs are the lowest as compared to other printers. The printout fades gradually rather than coming to a halt suddenly. You therefore get plenty of time to change the ribbon before crisis emerges. They use paper continuously unlike other printers that require frequent change of paper. The maintenance cost is low as compared to other printers. They tolerate dirty and hot conditions as are found in industrial environments. The output is not high resolution. Color printout is limited and the print speed is also lesser as compared to non-impact printers. Therefore, the quality of print out in general is not very good. This affects the scanner readability of the print out. The printer creates great deal of noise while the pins strike the ribbon to the paper. The pins get bended easily destroying the print head. The single sheet of paper has to wound and aligned by hand which is time-consuming and hectic. This also makes it prone to jamming frequently. Although paper jamming can happen with any printer, fixing it here is not an easy task. The density of barcodes is low and may fail to match user’s standards. The pros and cons are fairly equal in number. It only depends on users’ requirements. Dot Matrix is the best when cost is a consideration and print quality can be compromised upon. In print outs that require high resolution, it can be disastrous. Nowadays, dot matrix printers are found in devices such as ATM’s, cash registers, and POS terminals in shopping outlets. Given the popularity of buying newer printer models and the novelty 3D printing, there’s not much outside help for dot matrix printer troubleshooting. After a reader left us a question on where the best place to take a Dot Matrix printer for repair, we wrote an article on how fix common Dot Matrix issues at home. About the Author: Andrew Yeung is the Marketing Director of ComboInk, a leading online provider of premium printer ink cartridges, including Canon cartridges and HP deskjet cartridges. By purchasing a large volume from factory, ComboInk is able to sell laser toner cartridges at steep discounts, saving small businesses thousands in operating costs each year. Great information for printer advantage and disadvantage. Please send more information for printer driver software. Thank you.